Hundreds of artists have studied at the Cape School over the course of our long history, we’ll use this page to feature their work. If you have studied at the Cape School and would like to be included, email us. “I was introduced to Hilda Neily and the Cape School of Art by a friend who had taken classes there. 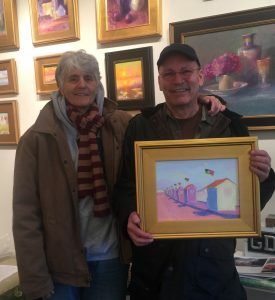 As much as I was blown away by the light and color in the paintings of accomplished Cape School artists, my first reaction to the class was bafflement, and my first block studies were way off the mark. I finished the first class and went home with a determination to figure it out and awareness that I had a lot to work on. 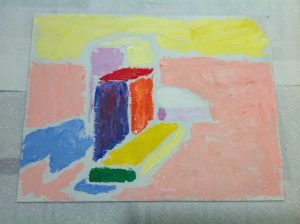 The perception of warm and cool colors and the balancing of color planes in relation to each other took a lot of effort, combined with the patience and assistance of a number of Cape School teachers including Hilda Neily, John Clayton and Cedric and Joanette Egeli. 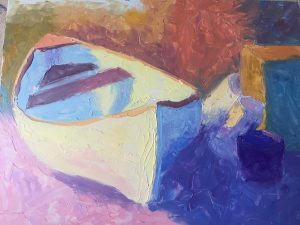 The key for me was persisting in painting numerous block studies, landscapes and still lifes until the interaction of color with light and shade gradually became more apparent. For a relatively slow learner like myself it was important not to be discouraged by the often slow pace of progress and to keep a steady flow of paintings going. By the end of my first year, I developed enough confidence to give a few paintings away to friends. To develop skills and confidence it is helpful to put your work in front of other people. At the end of my second year of classes, I was approached to donate a painting to the annual Cape School fund raising auction. To my amazement it sold, a situation I hadn’t really thought of. I recommend for anyone who takes Cape School classes to participate in the auction to push yourself toward the eventual goal of selling paintings while benefitting a great cause. The auction gives you a good idea of what your work can sell for, and a record of your skills over time. Local art associations are another good way to display and sell work for a modest investment in membership. Later on, I was able to place paintings in a nearby gallery/gift shop. 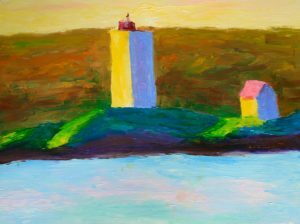 Painting local land and seascapes helps to develop skills and sell work more effectively. The effort to see the interaction of light and color moves the painting process forward. At the same time, the act of painting transforms the way light and color are perceived. For me, this is what makes it so fulfilling.